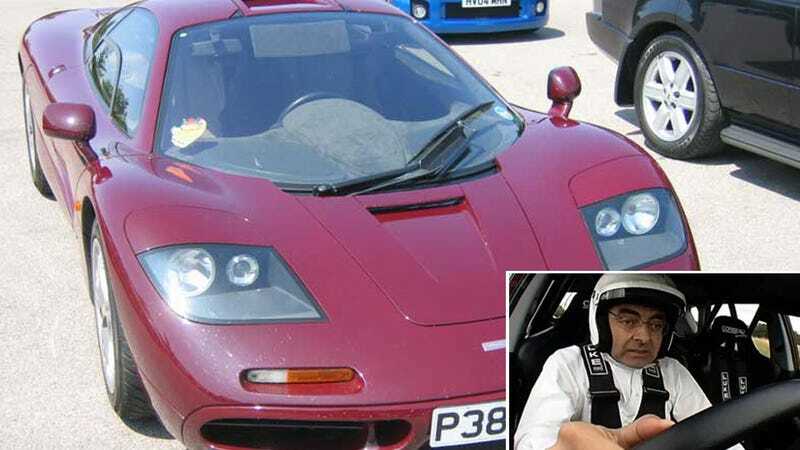 The actor Rowan Atkinson, known to most as the clumsy Mr. Bean, apparently cheated death this evening when he lost control of his powerful McLaren F1 (pictured) and hit a tree. The actor escaped the wreckage before the car burst into flames. UPDATE! Atkinson is an avid car collector and noted enthusiast who famously owns one of the rare McLaren F1 GTR models, which he smashed in 1999 after a fender bender. It's unknown whether speed was a factor in the crash, though the car does have a top speed of around 230 mph. The actor proved his mettle as a driver earlier this year after posting a great time around the Top Gear test track. Medical sources say Rowan suffered a minor shoulder injury while another onlooker said he was "lucky to be alive." UPDATE: Photos that have been posted on PistonHeads show the vehicle in slightly better shape that originally reported in the British papers (GASP! ).